Bring on the veggies! 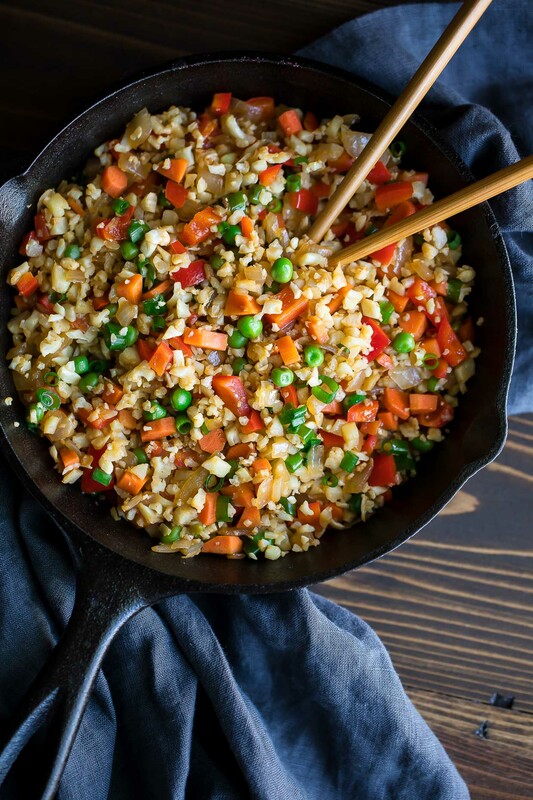 This tasty vegan Cauliflower Fried Rice packs a whole lot of vegetarian goodness into every serving and the leftovers are fantastic the next day! 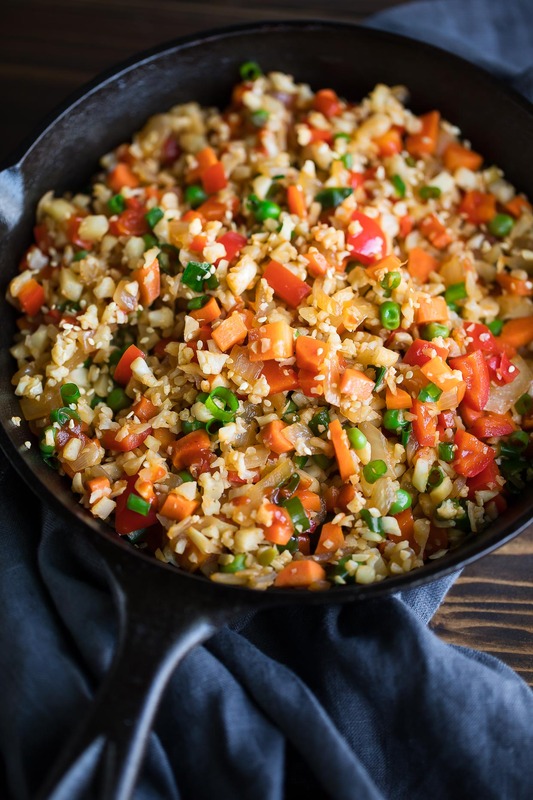 For all my vegan and vegetarian friends that found themselves longingly gazing at my Breakfast Cauliflower Fried Rice – fret not! 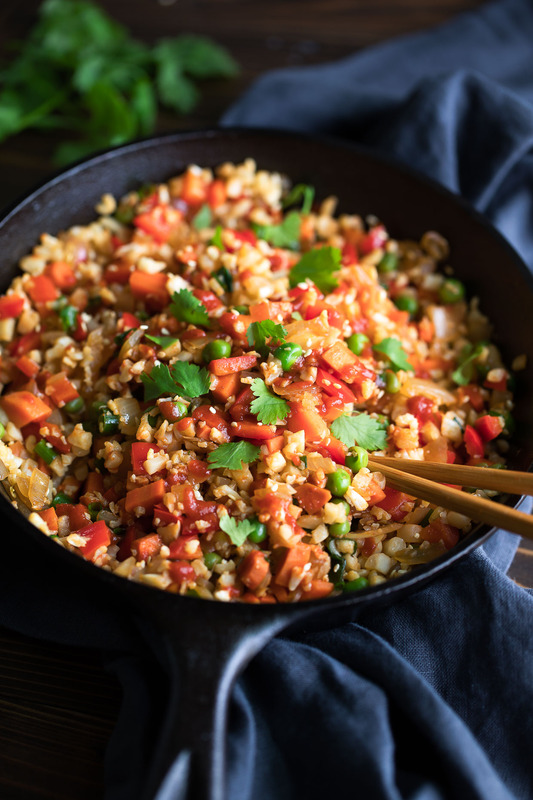 I’m always two steps ahead of you with plant-based recipe hacks and have a super tasty veganized cauliflower fried rice recipe to share today. Plus you can take things a step further and make it keto or paleo friendly with coconut aminos in place of the traditional soy sauce. I’ve also made this with gluten-free tamari and it’s marvelous that way as well! This way everyone has a chance to partake in the deeeeeeeliciousness that is cauliflower fried rice, which is basically cauliflower fried rice with jazz hands. Today we’re throwing veggies around like confetti, yo! If you’re new to the concept of cauliflower rice, it’s basically shredded bits-o-cauliflower that resemble grains of rice in texture. They’re a fantastic low-calorie alternative to rice for those with special diets or allergies, or for anyone that simply wants to eat more veggies. Most grocery store offer pre-riced bags of cauli rice in the produce section if you’re looking for a shortcut but it’s also relatively easy to make at home! Roughly chop into small florets. Use the food processor’s grater disc to transform the florets into “rice” or make it without the attachment by working in three batches. Working in small batches will help you get even texture. Simply pulse until the mixture appears minced/shredded and you’re good to go. Break into large pieces for easy handling and grate using the coarse side of your grater. As you run out of space for your fingers to grip the florets, simply mince any remaining pieces with a knife. This scrumptious side dish is great for make-ahead meal prep too! The leftovers can be heated on a skillet stove-top or in the microwave. For an extra punch of protein, pair this veggie stir-fry with my Sweet and Spicy Sriracha Tofu or your favorite tofu recipe! Shelled edamame also makes a tasty addition. Making your cauliflower rice from scratch? See post for methods and instructions and cauli rice it up! To save time I used fresh bagged cauliflower rice from the produce section. Peel and finely dice onions and carrots. Cut bell pepper into strips then chop into small pieces. Mince garlic and set aside. Heat a large lipped pan or skillet to medium-high heat with 1 TBSP oil. Sauté onion, carrots, bell pepper, and peas until the onions are translucent and the carrots/pepper/peas are tender and cooked through. Next add garlic and cauliflower rice. Sauté for 2-3 minutes or until the cauliflower is heated through. Season with salt and pepper, to taste. Give it a taste and 1. ensure your veggies are tender enough and 2. decide how much of your soy sauce you want to add. (you can always add more later) Mix it all together and stir in your green onion and add any additional salt/pepper/sauce to taste. Garnish with toasted sesame seeds if desired and drizzle with spicy Sriracha chili sauce before serving. Cilantro also makes a tasty topper! You can make this dish as mild or as spicy as you'd like! For a less spicy alternative, feel free to use sweet chili sauce on top of your cauli rice - it's delicious! As written this recipe is vegan, paleo, low-carb, gluten-free, and dairy-free, To make whole 30 compliant, use your favorite whole30 approved hot sauce in place of the Sriracha. Cilantro and shelled/steamed edamame also make tasty additions to this dish! Nutrition Facts below are estimated for fried cauliflower rice using an online recipe nutrition calculator. Adjust as needed based on sauce choice and swaps/extras and enjoy! 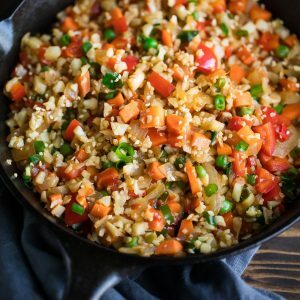 If you get a chance to try this vegan cauliflower fried rice, let me know! Leave some love in the comment form below or tag your photos with @peasandcrayons on Instagram so I can happy dance over your creation! I can’t wait to see what you whip up! I’m actually not a fan of fried rice, but I love cauliflower rice. This recipe did not disappoint – it was so good! 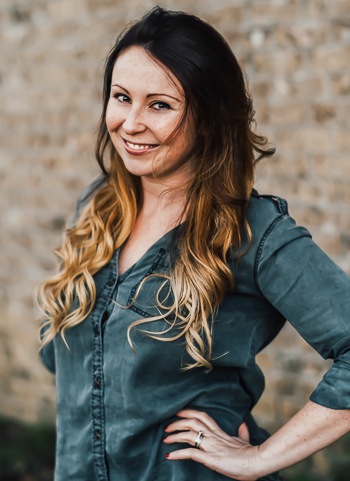 So glad you enjoyed it Justine, thanks! Scrumptious. Best way to make cauliflower.